The bank J PMorgan Chase has lost two billion dollars. To paraphrase Jamie Dimon, current chairman, president, and chief executive officer of the bank, "Oops, sorry. It won't happen again." Am I having a flashback to 2008? The United States, no the entire world, went through the biggest financial crisis since The Wall Street Crash of 1929. Now, just three plus years later, where are we? Little has been done to legislate reforms in the banking industry and both Wall Street executives and Conservative politicians have been taking the stance that free markets should remain free and be self-regulating. I'm sure that anyone in a democratic country would vote for freedom and anybody who believes in capitalism would say self-regulation is the way for business to separate the wheat from the chaff. Only the big boys get to swim in the deep end of the pool. However, there is theory and then there is reality and are we collectively, or at least some of us, falling into the trap the author Rita Mae Brown warned us about? "Insanity: doing the same thing over and over again and expecting different results." Paul Krugman is an American economist with credentials coming out the ol' wazoo including 20 books, over 200 scholarly articles in professional journals and more than 750 columns about economic and political issues for The New York Times. Oh yeah, he also won the Sveriges Riksbank Prize in Economic Sciences (informally the Nobel Prize in Economics) for the year 2008. (The prize included about $1.4 million.) In other words, ignoring my irreverence, here is a man who knows what the hell he's talking about. Sometimes it’s hard to explain why we need strong financial regulation — especially in an era saturated with pro-business, pro-market propaganda. So we should always be grateful when someone makes the case for regulation more compelling and easier to understand. He goes on to dissect both business as in Jamie Dimon and politics as in Mitt Romney. The pro-business, pro-market mantra of these two representatives of no regulation movement fails to take into consideration one important aspect of the big banks: it's not their money; it's your money. If anybody, any company wants to bet at the roulette table, who are you to stop them? It's a free country. But what if they're playing at the roulette wheel with your money? Does the expression "free country" mean that somebody other than you has the right to play with your money? But a bank is a bank is a company so where exactly is "your money"? The deposits in the bank are federally insured, that is, guaranteed by the U. S. taxpayer. Yep, they're guaranteed by you. Just where did all that money come from to stop the zombie apocalypse in 2008? Your tax dollars at work. The point, again, is that an institution like JPMorgan — a too-big-to-fail bank, not to mention a bank whose deposits are already guaranteed by U.S. taxpayers — shouldn’t be engaged in this kind of speculative investment at all. [If] Mr. Romney wins [the 2012 election]... he wants to repeal Dodd-Frank, and in general has made it clear that he would do everything in his power to set us up for another financial crisis. I'm sure the two words are distinctly different in everyone's mind, but just how close are the concepts? 1. The state of a society being without authoritarians or a governing body. 2. Anarchism; the political theory that a community is best organized by the voluntary cooperation of individuals, rather than by a government, which is regarded as being coercive by nature. I can drive anywhere I want if I follow posted speed limits and stop at red lights. The fact that I can drive anywhere I want represents freedom. The fact that all of us (hopefully) obey the speed limit and red lights means we do NOT have anarchy. I feel good driving around knowing that some fool isn't going to be racing or driving like a maniac. If they want to risk their own life, that's their choice, they are free to do so but I object to them risking my life. I feel good driving through a green light knowing (hoping?) everybody coming the other way is going to stop at the red light and let me pass. That's a terrific rule so we can all get along, so that we all can drive where we want. Who wants anarchy? Every time I get in an elevator, I look up and there is a safety certificate stating the date of the last inspection. I get a warm fuzzy feeling that when the doors close, I am not going to plummet to the basement. Hats off to regulations which make it mandatory to regularly maintain elevators and to verify the quality of that maintenance with regular inspections. Is anybody going to argue with this? The odd thing about all these discussions is the ability of anyone to properly connect the dots. I fully understand my elevator plummeting into the basement and I would concur wholeheartedly with any regulation which would prevent anybody from being negligent about my life, yes my life. But do I understand the big picture implications of a Jamie Dimon or a Mitt Romney telling me freedom is good and regulations curb freedom? Yes, I'm all for freedom but somehow I'm not so partial to plummeting to my death in a runaway elevator. Yes I'm for freedom but wait a minute, did my bank just go bankrupt and can no longer give me my money back? Who's minding the store? Cost-cutting measures on the part of BP and its partners along and the lack of a system to ensure well safety lead to what remains the largest accidental marine oil spill in the history of the petroleum industry. (Wikipedia; New York Times) Anybody against government regulations now? Or have we already forgotten about this catastrophe? I hear the polarization in the political dialogue. Right or left. Liberal or conservative. Democrat or Republican. If it was that easy, it would be done by now. I, for one, do not want to get into an elevator and subsequently plummet to my death. Likewise I don't want to put my money in a bank and have somebody else riskily invest it in what is the equivalent of gambling. When the government tells me to drive 60 mph, it is not telling me where to go. It is not taking away my freedom; it is merely saying that I stand a better chance of getting where I want to go at 60 then at 100. It doesn't want to stop me from going where I want; it actually wants to see me get there alive and uninjured. If the government better controls the banking industry, there is a better chance checks and balances will prevent individuals from partaking in risky behaviour. As I said in the beginning, if somebody wants to gamble with their money, well, this is a free country, they are free to do so. But they should not be allowed to gamble with other people's money. Hell, I don't want them gambling with my money! Oh I hear you say, "It's not my money." Think again. JPMorgan is a federally regulated bank that benefits from depositors insurance. That insurance comes from the government and where does the government get its money? Hel-lo Mr. and Ms. Taxpayer! Paul Robin Krugman (born February 28, 1953) is an American economist, Professor of Economics and International Affairs at the Woodrow Wilson School of Public and International Affairs at Princeton University, Centenary Professor at the London School of Economics, and an op-ed columnist for The New York Times. In 2008, Krugman won the Sveriges Riksbank Prize in Economic Sciences (informally the Nobel Prize in Economics) for his contributions to New Trade Theory and New Economic Geography. According to the Nobel Prize Committee, the prize was given for Krugman's work explaining the patterns of international trade and the geographic concentration of wealth, by examining the impact of economies of scale and of consumer preferences for diverse goods and services. Krugman is known in academia for his work on international economics (including trade theory, economic geography, and international finance), liquidity traps and currency crises. He is the 17th most widely cited economist in the world today and is ranked among the most influential academic thinkers in the US. As of 2008, Krugman has written 20 books and has published over 200 scholarly articles in professional journals and edited volumes. He has also written more than 750 columns dealing with current economic and political issues for The New York Times. He also writes on various topics ranging from income distribution to international economics. 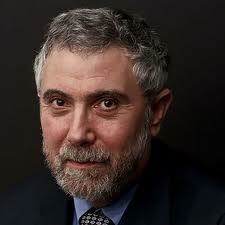 Krugman considers himself a liberal, calling one of his books and his New York Times blog "The Conscience of a Liberal". His commentary has attracted considerable comment and criticism. Is it possible that I have misjudged Mitt Romney? My take has always been that he’s a smart guy who also happens to be both ambitious and completely amoral; he decided that his career can best be advanced by pandering to the crazies of the right, and will say anything to that end. More and more, however, he has been coming out with statements suggesting that he is, in fact, a dangerous fool. A larger loss could have fallen to the taxpayer because as a federally regulated bank, JPMorgan benefits from depositors insurance. The as-yet unimplemented Volcker Rule in the 2010 Dodd-Frank Wall Street reform law is meant to prevent federally backstopped banks from making the kinds of risky bets JPMorgan took. Romney would repeal that law. In April 2012, hedge fund insiders became aware that the market in credit default swaps was possibly being affected by the activities of Bruno Iksil, a trader for JPMorgan Chase & Co. and referred to as "the London Whale" in reference to the huge positions he was taking. Heavy opposing bets to his positions are known to have been made by traders, including another branch of JPMorgan, who purchased the derivatives offered by JPMorgan in such high volume. Early reports were denied and minimized by the firm in an attempt to minimize exposure. Major losses, $2 billion, were reported by the firm in May, 2012 in relationship to these trades. The disclosure, which resulted in headlines in the media, did not disclose the exact nature of the trading involved, which remained in progress as of May 16, 2012 as J.P. Morgan's losses mount and other traders seek to profit or avoid losses resulting from J.P. Morgan's positions. The trades are possibly related to CDX IG 9, a credit default swap index based on the default risk of major U.S. corporations that has been described as a "derivative of a derivative". On the company's emergency conference call, JPMorgan Chase CEO Jamie Dimon said the strategy was "flawed, complex, poorly reviewed, poorly executed, and poorly monitored". The episode is being investigated by the Federal Reserve, the SEC, and the FBI. The Dodd–Frank Wall Street Reform and Consumer Protection Act (Pub.L. 111-203, H.R. 4173) is a federal statute in the United States that was signed into law by President Barack Obama on July 21, 2010. The Act implements financial regulatory reform sponsored by the Democratically controlled 111th United States Congress and the Obama administration. Passed as a response to the late-2000s recession, the Act brought the most significant changes to financial regulation in the United States since the regulatory reform that followed the Great Depression, representing a significant change in the American financial regulatory environment affecting all Federal financial regulatory agencies and almost every aspect of the nation's financial services industry. As with other major financial reforms, some legal and financial scholars on both sides of the political spectrum have criticized the law, arguing on the one hand that the reforms were insufficient to prevent another financial crisis or additional "bail outs" of financial institutions, and on the other hand that the reforms went too far and would unduly restrict the ability of banks and other financial institutions to make loans. The Volcker Rule is a specific section of the Dodd–Frank Wall Street Reform and Consumer Protection Act originally proposed by American economist and former United States Federal Reserve Chairman Paul Volcker to restrict United States banks from making certain kinds of speculative investments that do not benefit their customers. Volcker argued that such speculative activity played a key role in the financial crisis of 2007–2010. The rule is often referred to as a ban on proprietary trading by commercial banks, whereby deposits are used to trade on the bank's own accounts, although a number of exceptions to this ban were included in the Dodd-Frank law. The rule's provisions are scheduled to be implemented as a part of Dodd-Frank on July 21, 2012, with preceding ramifications.